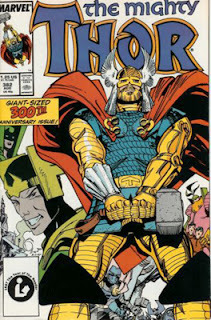 In 1983, Marvel Comics hired writer/artist Walter Simonson to take the reins of The Mighty Thor, one of their oldest and most venerated titles. 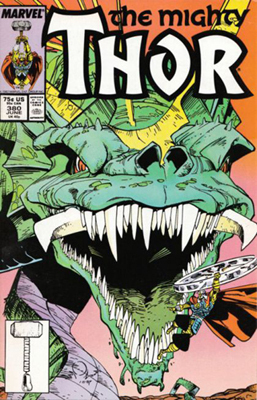 Simonson began his work on issue #337, titled simply "Doom," bringing to the title a unique style of art and story-telling that would revolutionize the way comic collectors looked at Thor. Simonson went on to pen 43 of the next 44 issues of Thor (taking only one month off after a very long story arc concluded), creating a body of work that I argue is unparalleled in the history of comic-book storytelling. This 45 issue run, which lasted from Thor #337 through #382, has remained at the top of my list of comic-book series runs, and the full 45-issue sequence remains the pride and joy of my comic-book collection (and probably will remain so for the rest of my comic-collecting days). In this article, I would like to explore why this run represents the pinnacle of sequential-art storytelling, and perhaps highlight some elements that are missing from more modern comics. Thor has always been a bit different from the rest of the Marvel superheroes in that his powers derive from mythology, rather than mutation or a "radiation accident." Thor hails from Asgard, the mythological realm of the Norse gods, where he resides along with all the other Norse gods of legend - Loki, Odin, and all the rest. However, over the years, authors of Thor varied dramatically in how much they played up, or played down, this link to mythology. 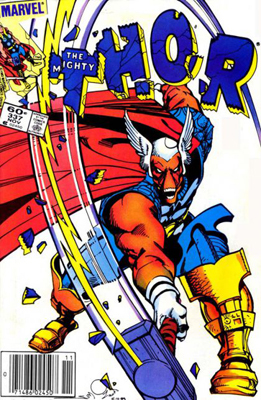 Prior to Simonson taking the reins, Thor had, for many years, been treated more-or-less as a normal superhero, with a regular "secret identity" (Donald Blake), and had generally encountered "mortal" challenges. He fought regular super-villains such as the Absorbing Man, similar to those battled by The Hulk or the other Avengers, far more often than he battled mythological beasts. Walt Simonson decided to change all that, and, beginning in Thor #337, he returned Thor to his mythological roots in dramatic fashion. This "return to Thor's roots" began, somewhat strangely, with Thor being charged by his father, Odin, ruler of the Norse gods, to investigate an alien threat from across the galaxy. Initially, no doubt most readers would not suspect that this story would lead into a multi-year romp through the Nine Worlds of ancient myth. Indeed, at first, the story takes a very strange turn, as Thor encounters a horse-faced being called Beta-Ray Bill. The two were nearly evenly matched in strength and fighting prowess, and fought to a standstill. Then, in a surprise twist at the story's end that had readers talking for months afterwards, Beta-Ray Bill manages to grab hold of Thor's hammer, and, because he is worthy, obtains Thor's powers -- he becomes, essentially, "Beta-Ray Thor." Simonson followed up this shocking turn of events by having Odin summon both Thor and Beta-Ray Bill to him. Bill, it turned out, was protecting his people from an army of demons, and needs the power of that hammer to fend them off. Thor, of course, wants his hammer back. In Thor #338, Odin has Thor and Bill battle to the death, but again they stalemate. Bill wakes up first, and drags Thor back to Odin's throne room, refusing to kill the noble warrior. Bill is honorable, and is not willing to take the hammer from Thor after what is clearly a tied battle. Odin solves the dilemma in Thor #339 by fashioning a second hammer, Stormbringer, with exactly the same powers as Thor's Mjolnir. Beta-Ray Bill then leaves earth with the Norse goddess Sif, to protect his people. Throughout these stories, Simonson hinted at a larger tale being woven. In each issue, the reader was given a glimpse of a "far off place" where a mysterious smith was slowly hammering out a giant greatsword, and a crowd of eager beings was watching. "Doom!" echoed the hammer, with each blow. Over the next several issues, the underlying story of this sword-forger slowly develops, as Thor begins to encounter more and more characters from Norse legend and the Nine Worlds, rather than earthly super-villains. He encounters Fafnir the dragon, and is seduced by the goddess Lorelei, and meets an ancient Viking who longs for death. Thor also battles Malekith, the Dark Elf, who unleashes the Great Hunt to find the Casket of Ancient Winters. And, of course, Loki persistently tries to trip Thor up. Eventually, however, we learn that the various one- and two-issue stories we've been reading about these mythological beings are all inter-related, as they are being unleashed by the greatest villain of them all -- Surtur, lord of the fire giants. It is he who has been forging the greatsword "Twilight." According to the prophecies, when Surturu bathes his Twilight sword in the eternal flame of Asgard (a flame Odin had stolen from the fire giants in a past age), the Nine Worlds (i.e. the universe) will burn, and Ragnarok (the end of the world) will begin. 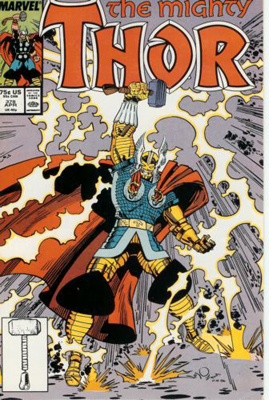 Simonson's "Surtur Saga," begun in Thor #337, reaches its climax in Thor #350-353. So long, involved, and complex was this four-part story, called "Ragnarok and Roll," that Walt simply couldn't tell it all in the double-sized #350. The Ragnarok stories guest-star many Marvel characters, including the Avengers and the Fantastic Four, and feature the return of Sif and Beta-Ray Bill to Thor's side. Together, Thor and the heroes battle Surtur's demons (the same ones who had threatened Beta-Ray Bill's people all the way back in Thor #337). And finally, Thor, Odin, and even Loki combine to battle Surtur himself in the final show-down. When Thor #353 concludes, Odin and Surtur fall into a great open chasm, which then closes above them. The Nine Worlds are saved, but at the cost of Odin the All-father. The Surtur Saga with which Simonson began his epic run of Thor stories, stands out as his greatest work, and perhaps the greatest storyline ever written in comic-books. It lasted sixteen issues, slowly, gradually building bit by bit to a satisfying conclusion. The aftermath of this story-line echoed down through the Thor comic for many issues following, as Thor first grieves, then searches for his missing father, and as the Asgardians go about selecting a new king. For the next two years, Simonson continued to weave wonderful stories in the Thor comic. Although Thor would often return to earth, he frequently met and battled enemies with their roots in Asgardian mythology. Additionally, Siimonson gave a great deal of "screen time" to the supporting characters of the Thor pantheon -- Balder the Brave (who eventually became king of Asgard), Loki, Lorelei, the Enchantress, Karnilla the Norn Queen, The Warriors Three (Volstagg, Hogun, and Fandral), and Volstagg's children (especially his feisty daughter Hildy). It would have been easy for the human (if we can call Asgardians that) element to be lost among the mythological wars and battles being fought in each issue, but Simonson was careful to remember that comic-books are about characters, not about powers, and he ensured that those characters were always present. Significantly, these wonderful "side characters" give Thor something important to fight for when he tangles with enemies like the Midgard Serpent. After a while, Simonson clearly began to grow weary, and began running out of steam. He called upon his friend and long-time comic-book artist Sal Buscema to take the reins as artist, while Simonson continued to write the stories. The series hardly missed a step, as Buscema skilfully adjusted his own artistic style to be more like Simonson's. As Simonson drew near the end of his run, he decided to give Thor a more classical look. After a run-in with the goddess of the dead, Hela, Thor ended up with terrible facial scars, and brittle bones. To cover up the scars, he grew a beard, and to protect himself, he donned a suit of armor. 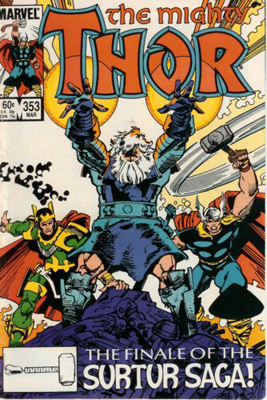 This gave Thor a look more in line with the Thor of ancient legend, which fit in quite well with the stories Simonson was crafting -- with the attempt to make Thor a comic-book more in line with mythology and fantasy than with the smash-em-up superheroing that went on in all the other titles. The look received mixed reviews, with some fans liking it, and some fans hating it. As Simonson's epic run on Thor approached its final conclusion, Uncle Walt (as readers used to call him) pulled one last, magnificent story out of the old myths. In Thor #380, Walt had Thor clash with the Midgard Serpent. Drawing from ancient Norse poetry and legend, Simonson and Buscema together crafted one of the great tales in the history of the Thor character, called "Mjolnir's Song." The titanic battle between Thor and the Midgard Serpent is depicted exclusively by splash pages -- each panel is the size of the entire page. There are few dialog or word balloons. Instead, narration "boxes" written in psuedo-poetic verse describe the action, and the pictures tell most of the story. When the tale ends, the Midgard Serpent is defeated, but Thor lies in a puddle, his bones having been turned to jelly by the curse of the death goddess. Simonson's run was now about up, but he wouldn't be Walt Simonson if he didn't clean up the predicament in which he had left Thor. During the last two issues, Thor, whose mind still exists inside the gelatinous mass that was once his body, manages to control Odin's destroyer, and uses it to threaten Hela. She finally relents, and undoes her curse, which allows Thor to once again be restored to his body. With this final story, in Thor #382, Walt ended his run on Thor, and rode off into the sunset. 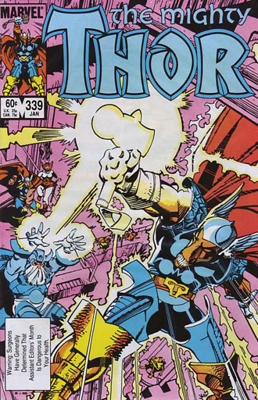 Walt Simonson wrote Thor for 45 issues, and drew the art for much of the run. Almost single-handedly, with help from his friend Sal Buscema on the later issues, Walt transformed Thor from a generic superhero facing generic Marvel villains, into a mythological figure worthy of the name "Thor." Along the way, he also transformed the Thor comic into what can almost be described as a "high fantasy" setting. We don't just follow the exploits of Thor the thunder-god in this series. We follow the story of Balder the Brave, and of Hildy, and of Volstagg and the Warriors Three. Simonson breathes life into Asgard, making it feel like a real place -- and significantly, a place that would fit on a shelf right along with Tolkien's Middle-Earth or Donaldson's Land. But what made Simonson's Thor run first-rate wasn't the fantasy setting, or the return to Thor's roots (although those certainly didn't hurt). What made his Thor run so fantastic was Simonson's strong and perpetual focus on character. Walt Simonson understood that the most important aspect of any story is the characters. He know that to propel the story forward, and to propel the reader with it, he had to give us someone to root for. And Simonson wisely did not limit himself to Thor, but included a whole pantheon of characters that were fleshed out, interesting, and developed. Throughout Simonson's Thor run, we see Balder the Brave change from an overweight, out-of-shape has-been who wants to die, into a once-again great warrior who becomes so capable and honorable that he is entrusted with the throne of Asgard after Odin's demise. We watch Gunnhild (Hildy), daughter of Volstagg, protect the queen from trolls and give her older brothers bloody noses when they dare make fun of her. We cheer on the budding romance between Sif and Beta-Ray Bill, and we laugh nastily at Lorelei and Loki when they have their spells turned back against them in the end. What Walt Simonson so clearly understood, then, and what made his run so fantastic, was character. Too often in comic-books today, the writers, and especially editors and marketing "experts," forget how important character really is. They seem to think that a superhero is just a collection of powers and a costume. To these people, "anyone" can be Batman as long as he wears the cowl, has gadgets, and calls himself "Batman" -- it doesn't have to be Bruce Wayne. Simonson, however, knew differently. And really, doesn't everyone, if you stop to think about it? You can't separate Bruce Wayne from Batman, any more than you can separate Anakin Skywalker from Darth Vader. But the fact that comic-book companies keep trying (for a recent example see Amazing Spider-Man #700 and following issues of the new series) shows that they don't understand what Walt knew in the 1980s. It's the character that matters, not the powers or the fancy suit. And this is why Walt Simonson's run on Thor stands so far above most other work in comic-book history. Walt was crafting epic tales on a larger canvas than most other writers before or since. It would have been easy for him to get "lost" in the clashes and the "bigness" of the tale. But he didn't. Instead, he kept breaking away from the huge fights to show us the smaller tales -- the story of Frigga and the children fleeing Asgard during the Ragnarok saga, or the story of the small boys who were left fatherless, and were adopted by Volstagg to be raised on Asgard. And because Simonson focused on characters, the bigness of his tale seemed that much more epic and sweeping, because those characters were exactly the people for whom Thor and the heroes were fighting. Simonson made us love them, and care about what happened to them, and want them to be safe. And that's what makes you keep turning pages, and keep plunking down your (at the time) 60 cents to read more next month. Simonson's Thor run should be required reading for every comic-book writer and editor who is currently working in the industry today. They need to be sat down, chained to an armchair with the stack of 45 Thors, and told "read these." Then when they're done, they need to be told, "Now learn from that and make your comic-books like that." And no, by that, I don't mean high fantasy or mythological. I mean simply this: focus on characters, instead of superpowers.